Reference number for this case: 22-Oct-54-Guebwiller. Thank you for including this reference number in any correspondence with me regarding this case. 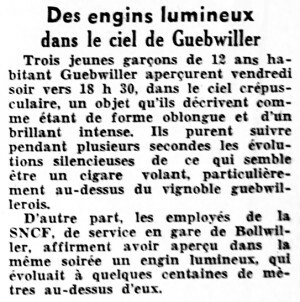 On October 24, 1954, the newspaper L'Alsace reported a "luminous craft in the sky Guebwiller." It was reportedly seen, among other people, by three 12-year-old boys, residents of Guebwiller, on Friday night, thus on October 22, 1954, at approximately 06:30 p.m. at sunset. They described it as silent, "of oblong shape and of an intense brightness," and they saw it "for a few seconds", "particularly over the Guebwiller vineyard." Three young boys, twelve years old, residents of Guebwiller, saw on Friday night around 06:30 p.m., in the twilight sky, an object they describe as an oblong shape and of an intense brightness. They managed to look for a few seconds the silent flight of what appears to be a flying cigar, especially over the vineyard of Guebwiller. In addition, the employees of S.N.C.F. [national railway company], on duty at the railway station of Bollwiller, state to have seen during the same evening a luminous machine which evolved at a few hundreds of meters above them. The two authors indicate, in order to illustrate their opinion on the poor content of the saucer reports in the press, the following extract of which they indicate that the source is the newspaper L'Alsace. "Three young people saw in the sky of Guebwiller an UFO of oblong shape and an intense brilliance." "A luminous balled followed by a long white trail crossed the sky..."
The two authors either are unaware of or do not indicate the date of publication of the newspaper article they quote. October 24: a flying saucer makes in 10 minutes duration an extraordinary demonstration in the sky of Wittelsheim. 3 young 12 year old boys living in Guebwiller saw towards 06:30 P.M. in the twilight sky an object which they described as being of oblong shape and an intense brilliance. They could particularly follow during several seconds the silent evolutions of what seems to be a "flying cigar," above the vineyard of Guebwiller. Luc Chastan indicates that in the Haut Rhin in Wittelsheim [sic] on October 24, 1954 at 18:30 hours, "an object made a 10 minutes long extraordinary demonstration in the sky of Wittelsheim. Three young 12-year-old boys living in Guebwiller saw towards 06:30 p.m. in the twilight sky an object which they described as being of oblong form and an intense brilliance. They particularly managed to follow during several seconds the silent operations of what seems to be a "flying cigar," above the vineyard of Guebwiller." The source is indicated as being my website at http://ufologie.net [Its old URL]. 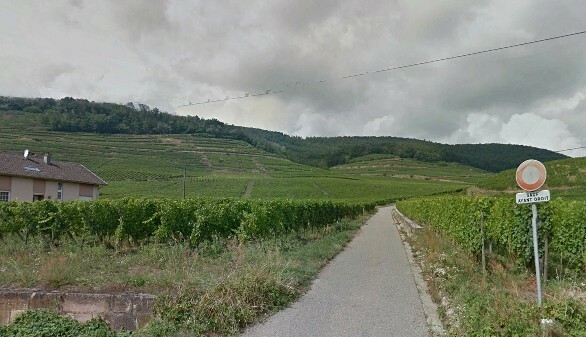 Three 12 year old boys followed the silent evolutions of an object of elongated shape above the vineyard of Guebwiller. The date given as October 24, 1954, by [bu1], [lc1], [sp4] is wrong. The error started with [bu1] who said the source is L'Alsace for October 31, 1954, but it is actually l'Alsace for October 24, 1954 [la1]. [lc1] misunderstood the affair: it is not in Wittelsheim; the Wittelsheim sighting is a different one. SPICA listed the same case twice [sp4] [sp5], each time with the wrong date. A part of the vineyard of Guebwiller seen in daytime in 2016. With so little information - a bright and silent oblong thing in the sky - we can only assume that it was possibly a meteor. [la1] Article in the regional newspaper L'Alsace, Mulhouse, October 24, 1954. [bb1] "La Grande Peur Martienne", book by Gérard Barthel and Jacques Brucker, Les nouvelles Editions Rationalistes publishers, France, page 139, 1979. [bu1] "C'était en 1954 - Cela fait déjà 50 ans", article on the web page "Buhl - Page d'Histoire", at perso.wanadoo.fr/mjc.buhl/Elfaluter/1954.htm. [cv1] "1954, l'année des OVNIS - Des observations par dizaines, des témoins par centaines", article by Christian Valentin in "Saisons d'Alsace", quarterly magazine, Dernières Nouvelles d'Alsace publisher, Strasbourg, France, page 93, summer 2004. 1.1 Patrick Gross February 20, 2014 Addition [ro1]. 1.1 Patrick Gross October 24, 2014 Additions [la1], [cv2]. Explanations changed, were "Not looked for yet. Probable meteor." This page was last updated on October 24, 2014.